Hello! This card is a bit different style for me. 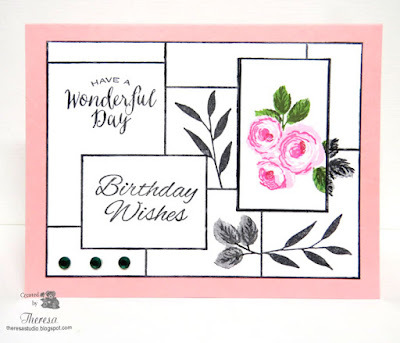 Just playing around with some old and newer stamps to make a birthday card. 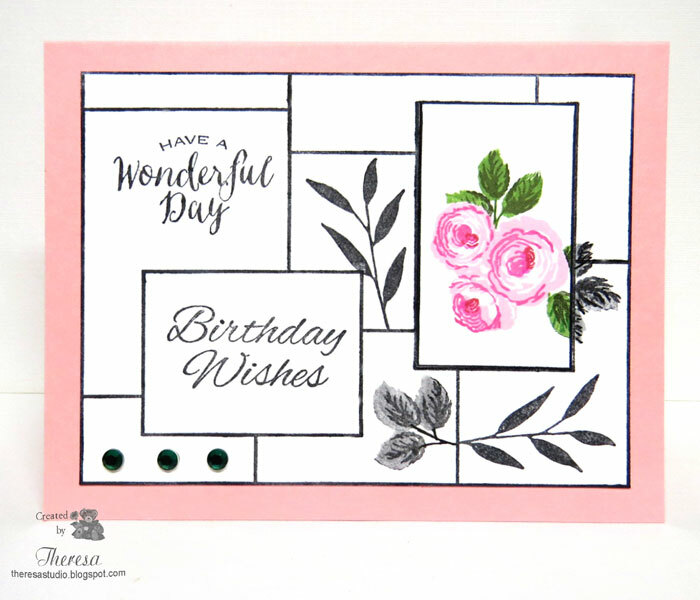 I used Gina K Designs Inspiration Mosaic stamp for the background design and filled in the "boxes" with sentiments, leaves, stems and some gems. I used the spotlight technique for the roses with leaves in one of the sections. All other stamps from GKD including Old Country Roses, Birds & Blossoms,and Wild Blossoms. 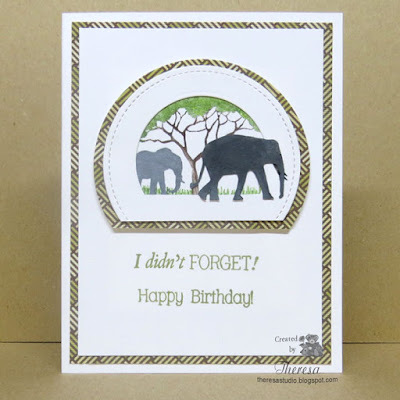 Used Memento Tuxedo Black and other colors inks for stamping. Stamp TV: Mix It Up Monday - Do some Spotlighting. Welcome! We are at the end of 2016 and ready for a New Year. I plan to keep on making cards and made this with some new items that I received as gifts in the magazine Simply Cards & Papercraft. The bonus included a snowflake die, snowflake embossing folder, and a snowflake stamp set. I used the EF with a white card stock panel and layered that on a mat of blue CS. I used 2 of the new stamps on Vellum with Versamark and embossed with Zing Silver EP. 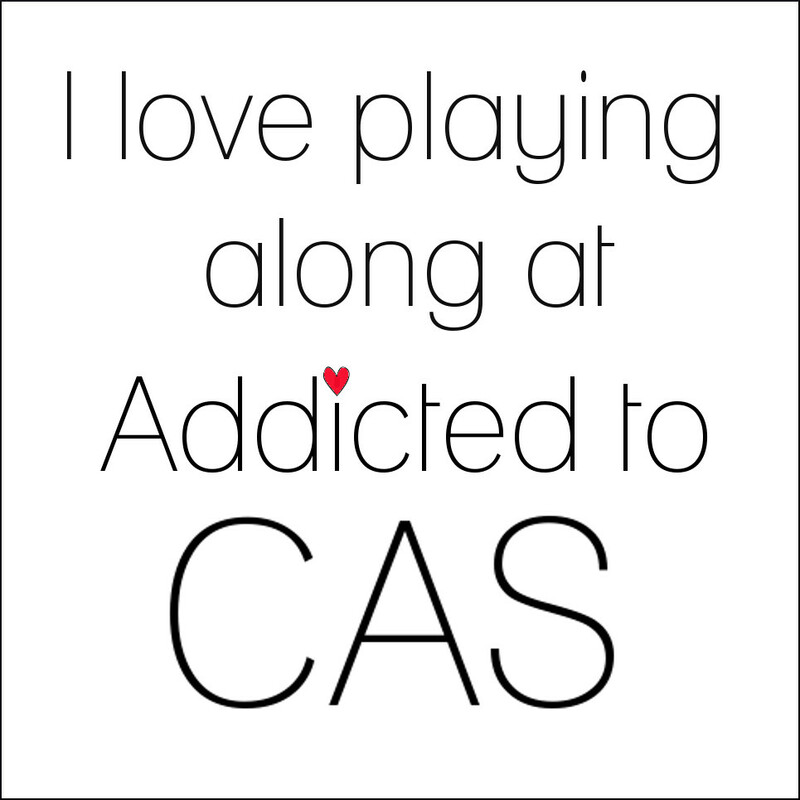 Then I cut the die on white CS and placed that on a blue circle. 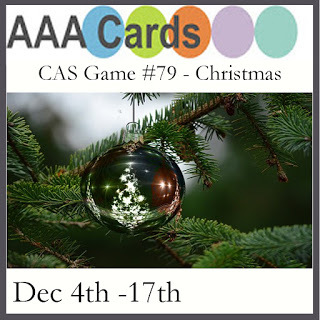 I assembled all the elements and finished with a gem to complete this winter card. What fun it is to play with new products! 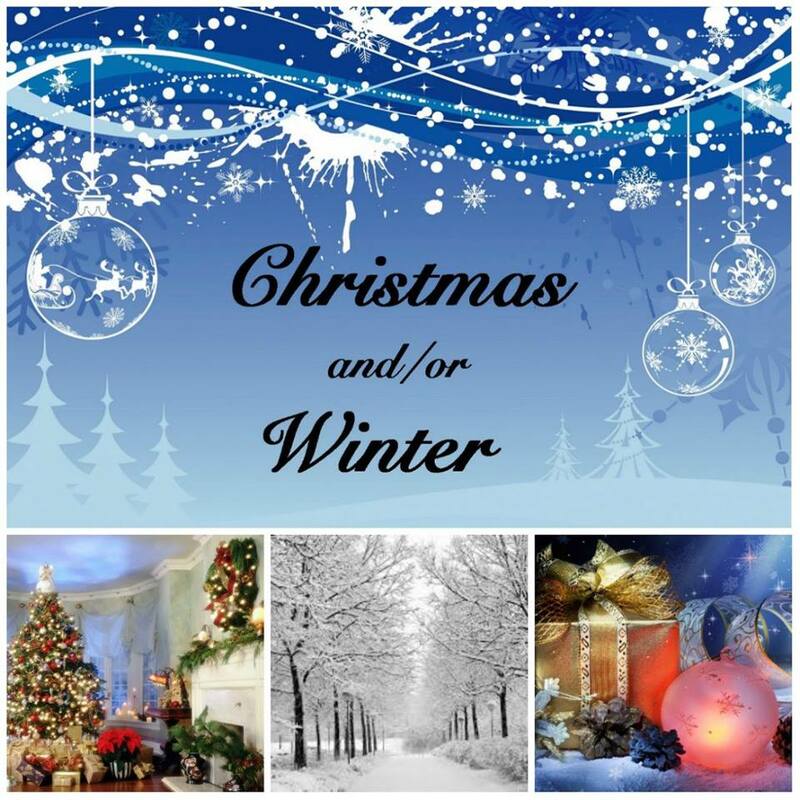 Merry Christmas to my family and friends! This card was made with a LOTV stamp James bearing Gifts. I stamped him with Memento Tuxedo Black ink and colored with Copics and added stickles to his cap. I used Sakura Stardust on the gifts for aome shine and sparkle. I framed the image with a mat of Red Glitter paper and attached to a White card base. 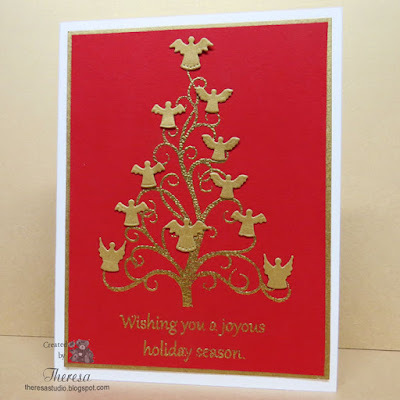 Finished with a ribbon and die cuts from Cheery Lynn in Gold Metallic CS. Tuesday Morning Sketches: #383 Annual Anything Goes challenge. 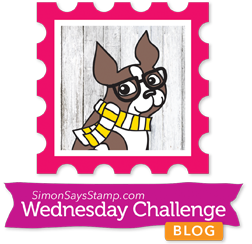 Simon Wednesday Challenge: Simon says Make It Sparkle! Thanks for your visits. I love reading your comments. Hello! Thanks for dropping by as I know everyone is very busy this week. 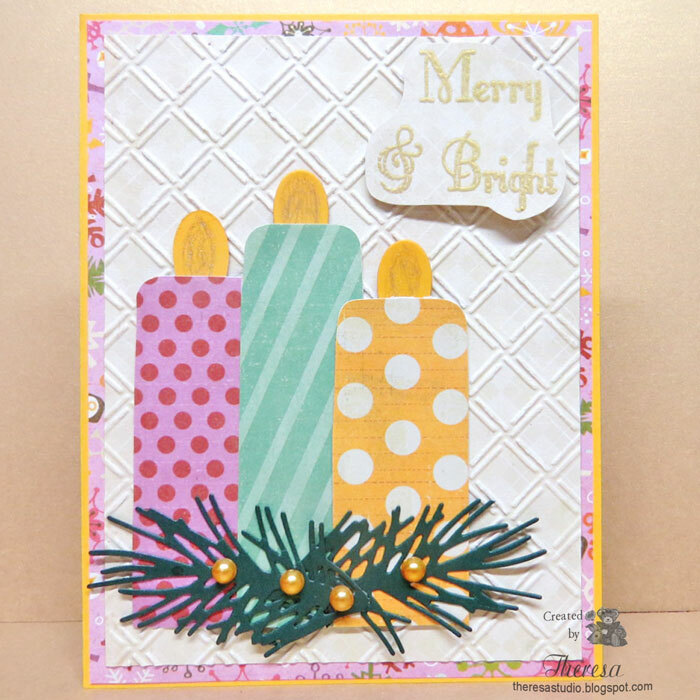 I am sharing a card that I made for Stamp TV's Mix It Up Monday Challenge to create a card using a past Gina K Designs holiday stamp set. 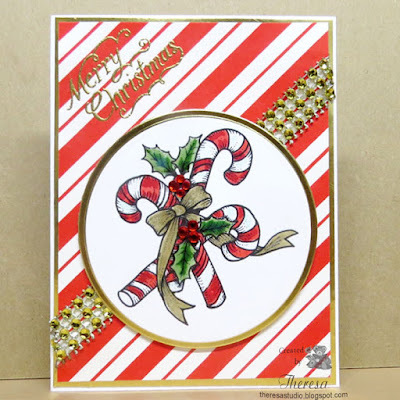 I chose to use Melanie's Festive Frame set that came out in 2009. I stamped the frame and sentiment with Versamark and heat embossed with Gold EP. I colored the flowers and pine cones with Copics. I trimmed the frame and attached to DCWV Gold Shimmer CS. I did not add any more embellishments as I did not want to overdo. 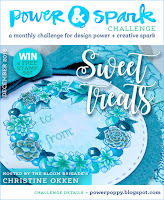 Simon Wednesday Challenge: Simon says Make It Sparkle. My card sparkles with Gold Embossing and Gold CS. Hello! Today, I am sharing 5 different cards all made with the same PSX Poinsettia stamp but with different designs. This stamp is one of my all time favorites for Christmas. 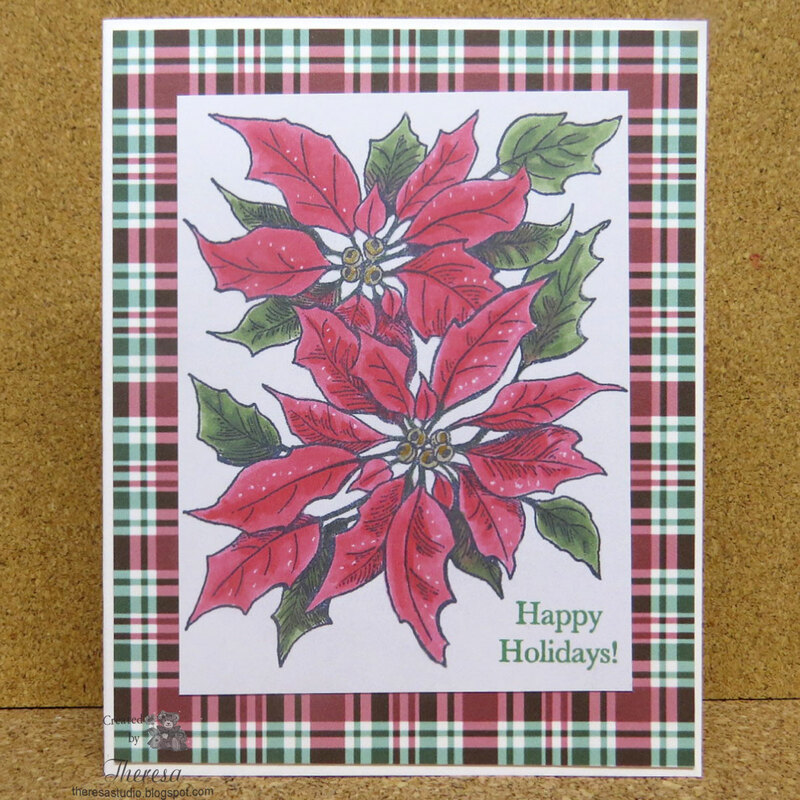 The image on the top card was fussy cut after coloring and the design finished with strips of Pattern Paper. These were all made at an earlier date for my card stash but I am just now posting. 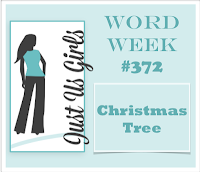 Tuesday Morning Sketches: #383 Annual Anything Goes. And the prize is a Misti! Wow! This one was simply edged with a Gold Metallic marker and adhered to a Red CS base. The ones below were finished with mats of Pattern Paper and card bases of white CS. Coloring was done with copics but varied shades. 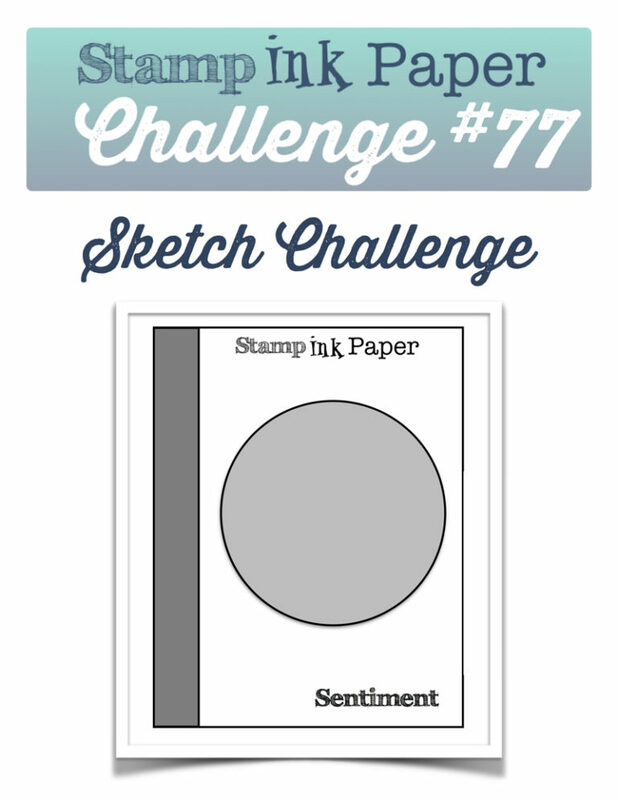 Sentiment stamps were from Gina K Designs. Hello! 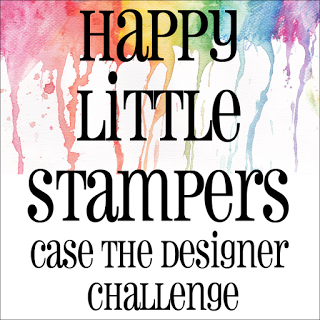 The Case the Designer challenge at Happy Little Stampers this month is to choose one of their cards from June - October that inspires us and CASE the card. 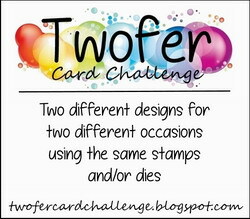 I chose the design by Carol from July that is shown below left. 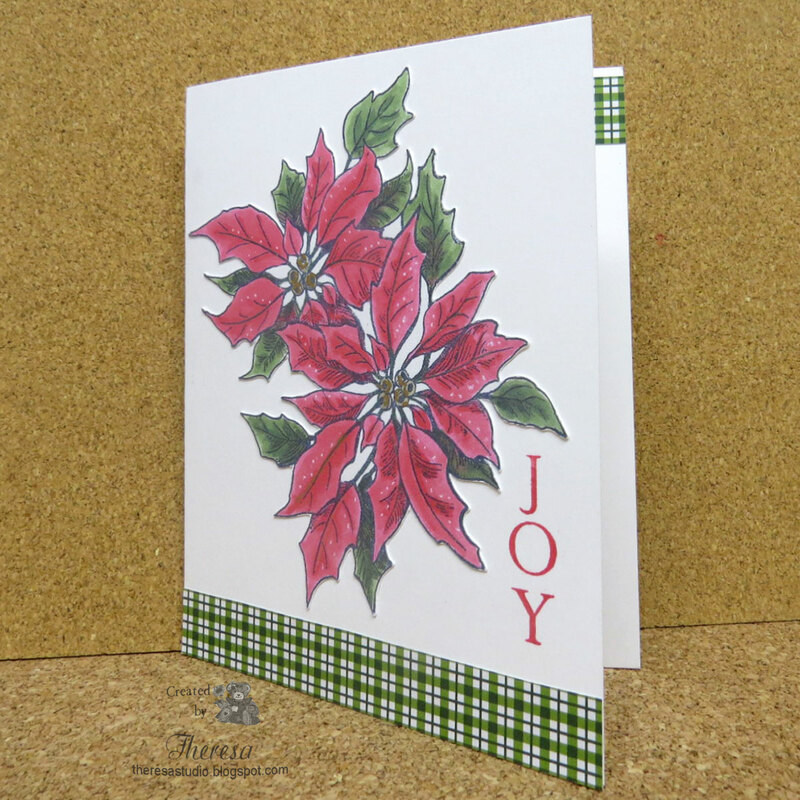 My card was made with some old stamps from Mark's Finest Papers using some pattern paper from DCWV Safari Chic pad. Hello! My card today uses some lovely ribbon that I won recently! I let the black and White ribbon play as the sentiment as well as an embellishment. 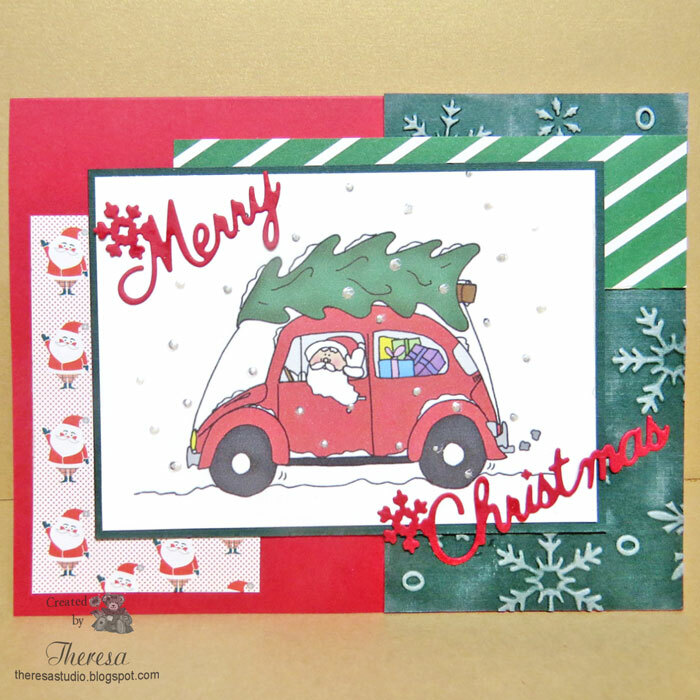 I stamped the Santa Sleigh with an Annabelle stamp and colored with Copics and Gold Metallic pen. I fussy cut and adhered to a white CS and framed with Gold Metallic CS and added some Gold Gems. 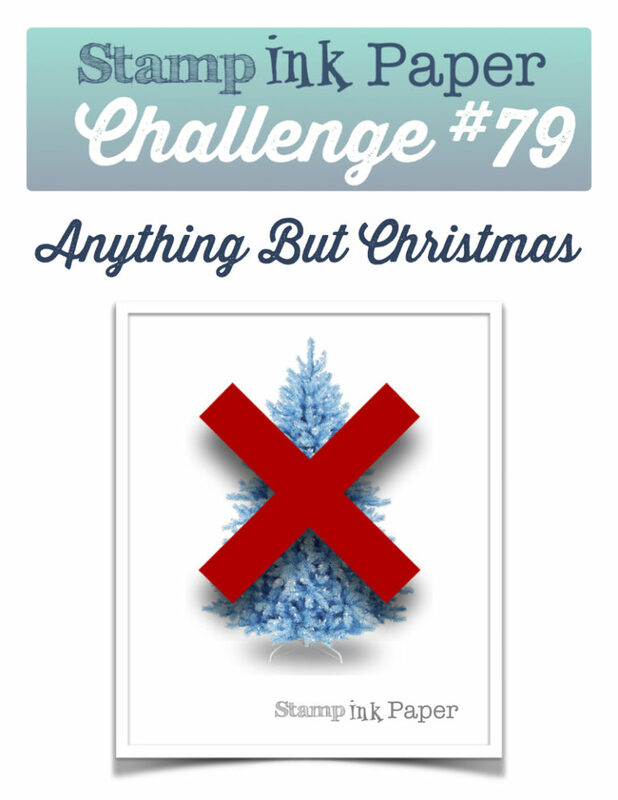 Simon Wednesday Challenge: Simon says Gift It! My sleigh is full of gifts. Hello! 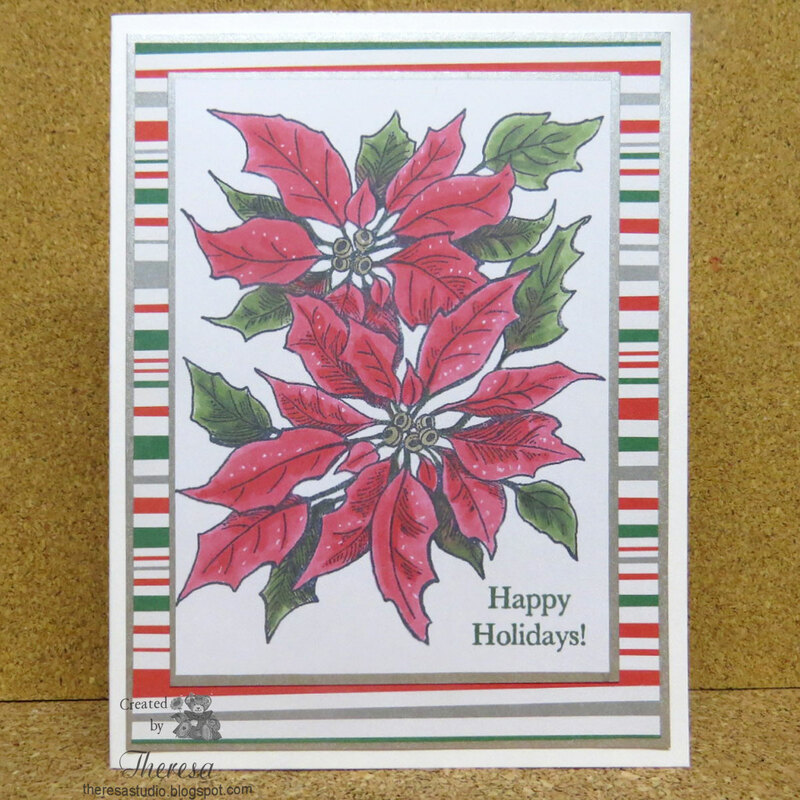 I have been playing again with Pattern Papers and a Challenge sketch to create this card. 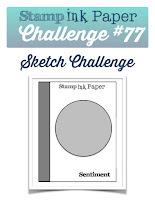 The papers are from Crate Paper Snowy Day pad and the sketch is from Tuesday Morning Sketches challenge. 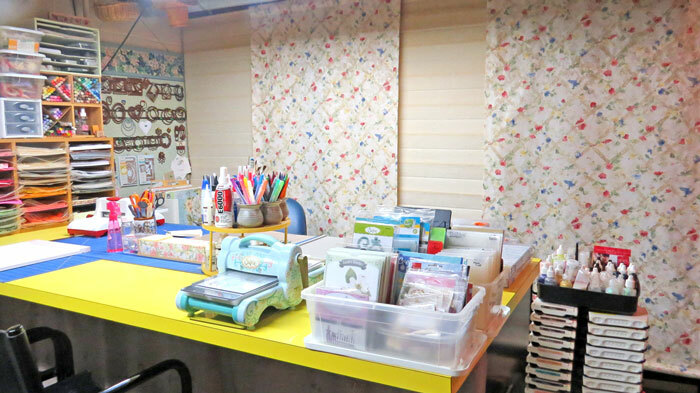 Other supplies: Yellow Gold and Green CS, Spellbinders Stamp, Versamark, Gold EP, Impression Obsession Pine Bough Die, Cuttlebug EF, Heartfelt Creations Flower Die(used petals for flames), Sukura Clear star pen, Gold Gems. Love the combo of non-traditional colors in the card. 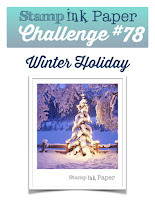 12 Days of Christmas: Kylie's Challenge to create Christmas cards. Hello! 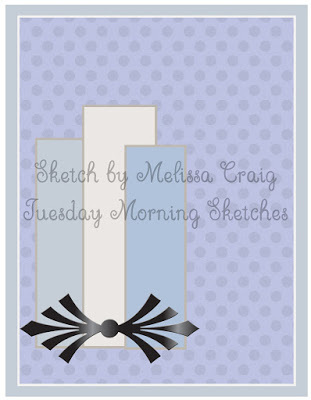 Playing with some pattern paper, a sketch, and a digital image resulted in this card. 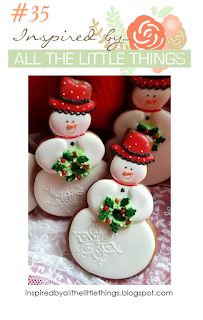 The Santa digi is from Dearie Dolls...just love these fun images. I follow the sketch from Sketch Saturday shown below. 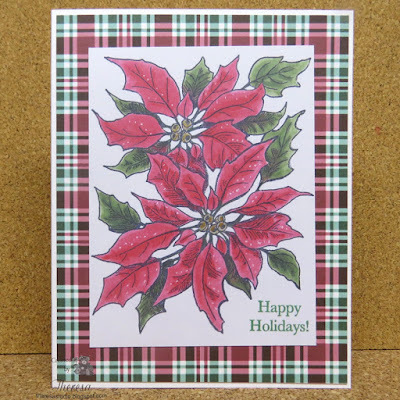 Other supplies: America Crafts Hollyday Pattern Paper pad, Red, White, Green CS, Darice Snowflakes EF, Cheery Lynn Merry Christmas dies, Brilliance Moonlight White ink, Liquid Pearls. 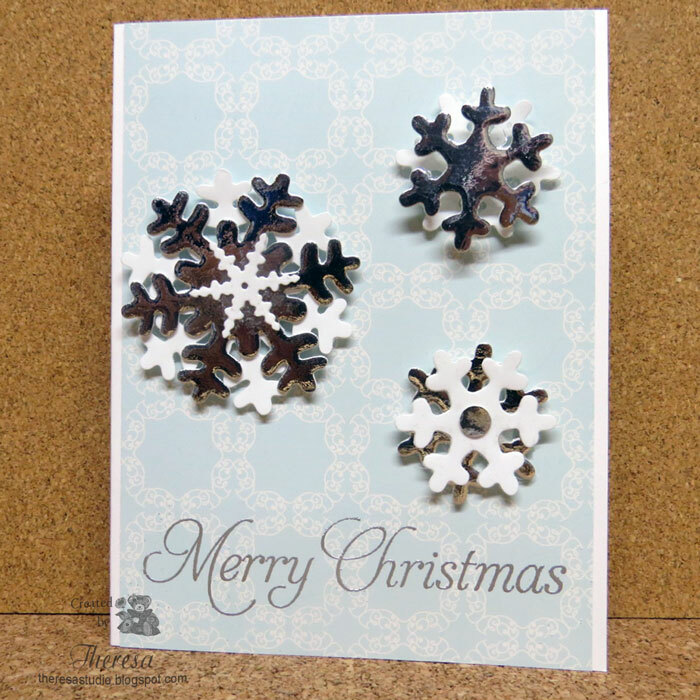 Cute Card Thursday: #456 Snowflakes. 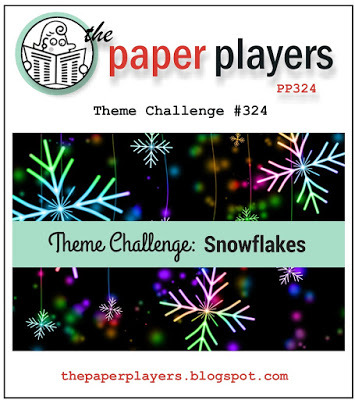 Used embossed snowflakes and snowflakes on image. 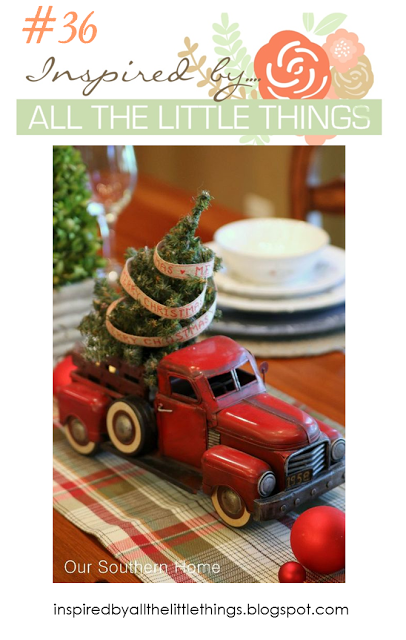 Inspired by All the Little Things: #36 Was inspired by the red vehicle and tree in the photo. 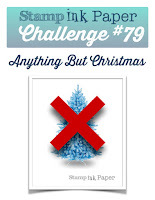 Simon Wednesday Challenge: Simon says Gift It. I included this image of Santa bearing Gifts in the back of the car. Doodle Pantry : Ants in my Pantry Digital Challenge 24 use any digital image. Hello! 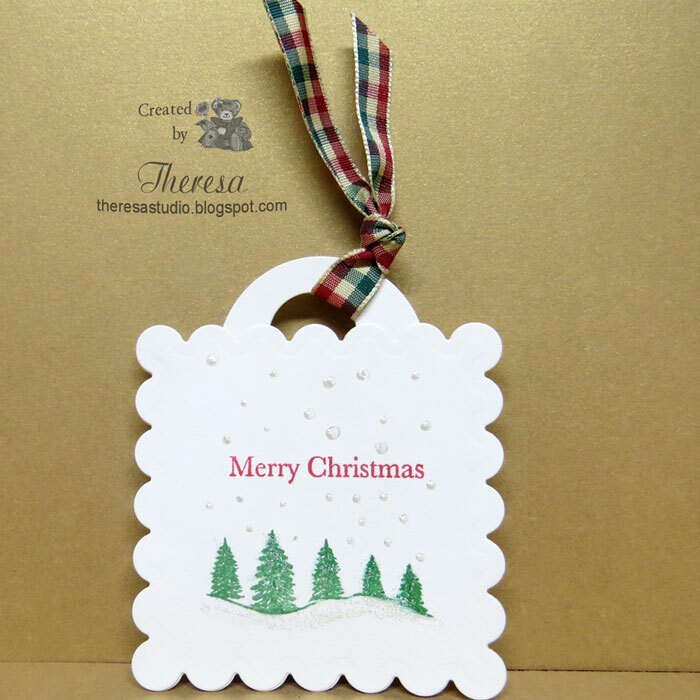 Another quick Christmas card made with a new stamp that I won from Just For Fun stamps. 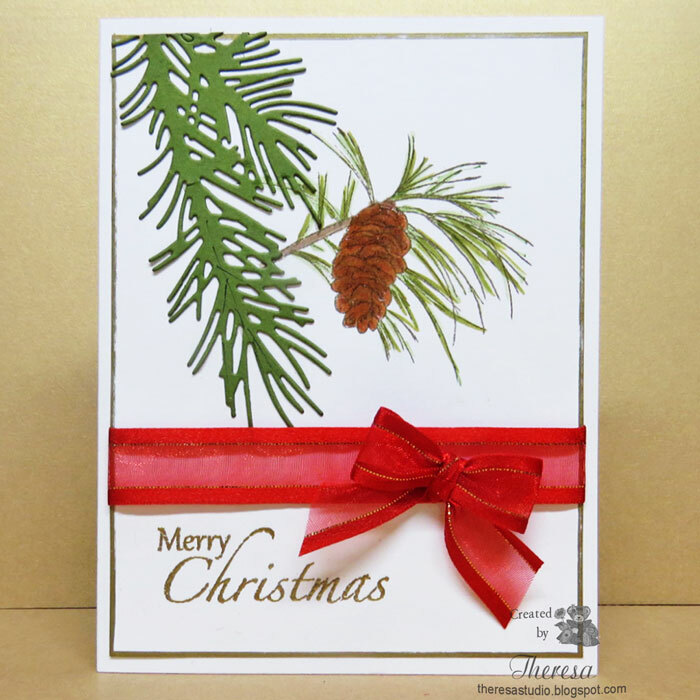 I stamped the large Pine Bough 3 times with SU Always Artichoke ink on white CS...love the details in the stamp. Added some Frosted Lace stickles to give an icy look. Finished with a Sentiment in Memento Red ink and a plaid ribbon. Used a GKD Green card base. Another Christmas card using some freebie stamps from Quick Cards Made Easy and sentiment from GKD. 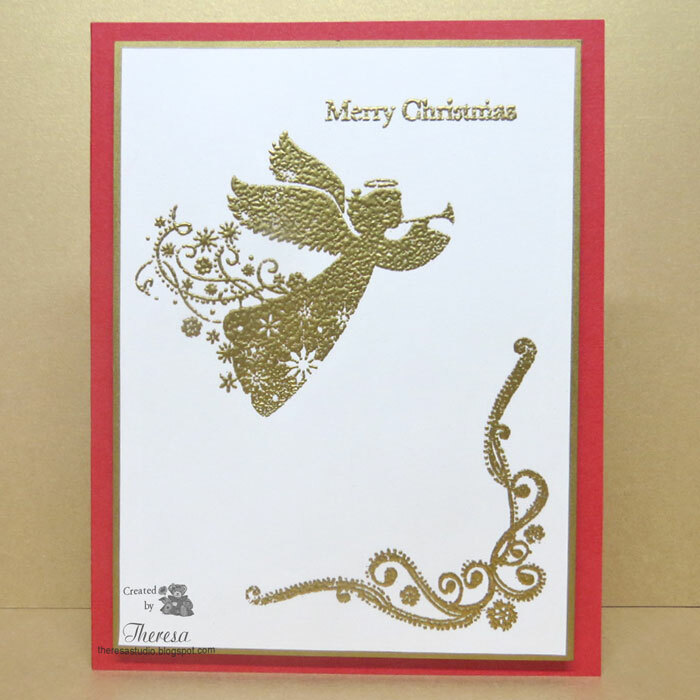 I stamped with Versamark and heat embossed with Gold EP on white CS that I edged with Pilot Gold Marker. I adhered this to foam and then a Red card base. 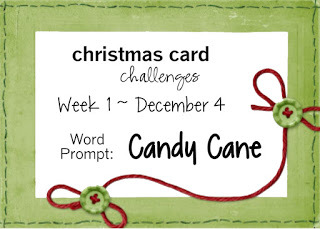 Twelve Days of Christmas Challenge: Kylie challenged us to link up Christmas cards to her challenge with great prizes. 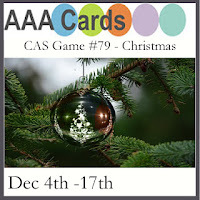 As You Like It Challenge: Favorite Gold or Silver. Gold is so rich and warm is why it is my fave. Hello! 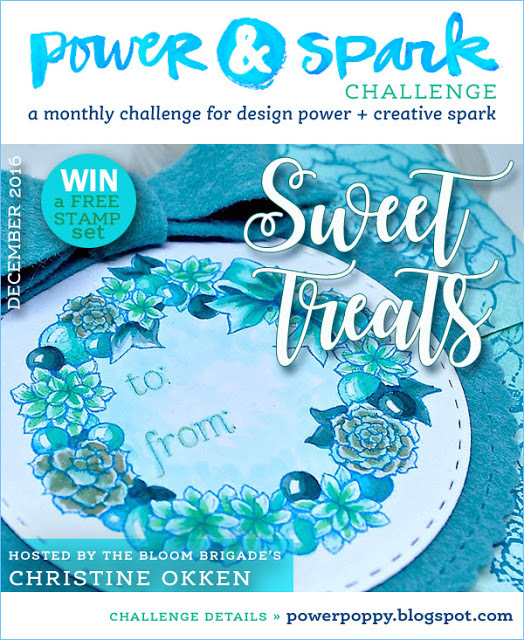 I am sharing a tag that I made for some challenges using Gina K Design stamps from Northwoods (trees) and Peace and Joy(sentiment) sets and Memento inks. Added Liquid Pearls Drops and Frosty Lace Stickles for snow and Plaid Ribbon. 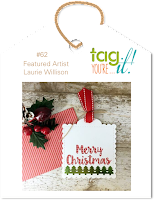 Cut tag with Nesties Scallop Square die. Stamped the back with To: and From:. 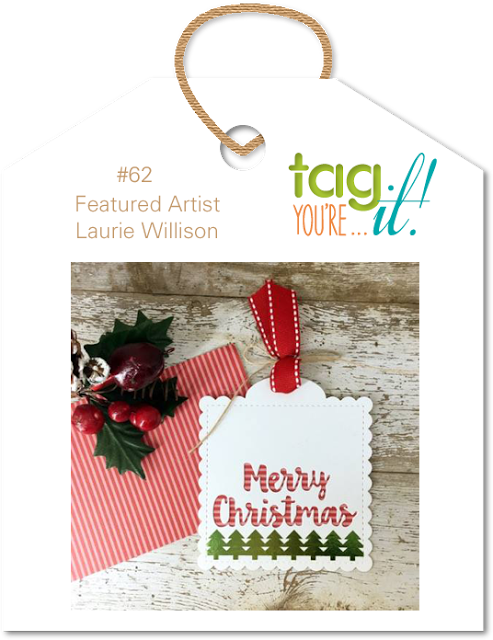 Tag You're It Challenge: Tag #62 featuring Laurie Willison. Was inspired by the shape of her tag and the layout. Also used the theme of Merry Christmas with Trees. Hello! For today's Christmas card, I combined a Pine Cone stamp from GKD Peace & Joy set. 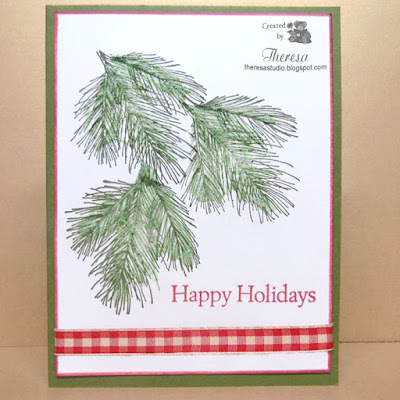 with a Pine Bough cut using an Impression Obsession die. 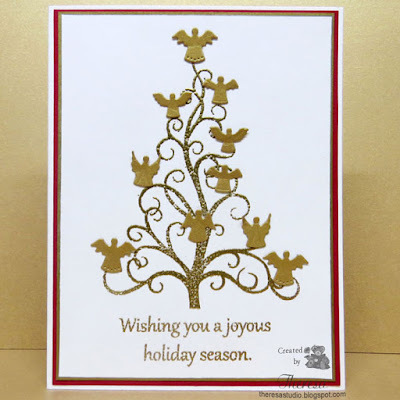 I stamped and gold embossed the GKD sentiment from Joyful Holiday set. Finished with GKD ribbon and bow and some glossy Accents on the cone for texture. 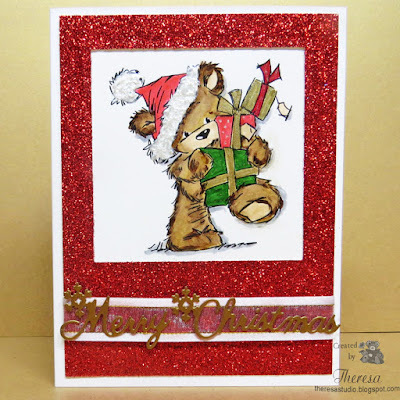 Stamp TV: Release Challenge Add a Bow to your card. Hello! 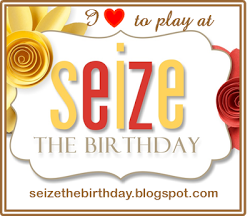 Another card for today. 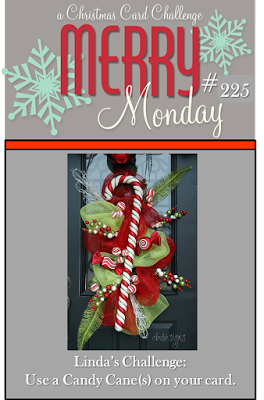 I used a Power Poppy Digital Stamp Candy Cane Classic and a sentiment from Power Poppy Poinsettias set to create this sweet treat. 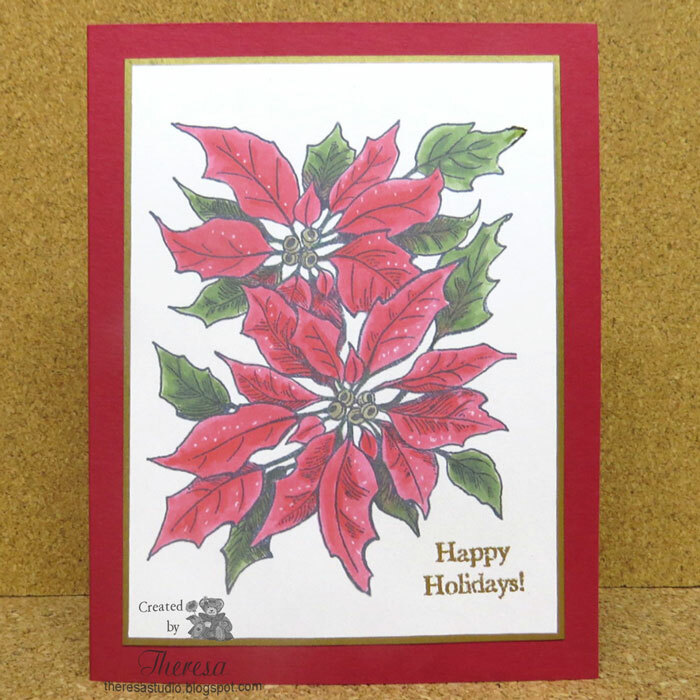 The image was colored with copics with touches of Red Rhinestones, Glossy Accents, and Sakura Stardust pen. The sentiment was heat embossed with Gold EP. Mats cut from Gold Metallic card stock were layered under the pattern paper background and the image. The ribbon used is Diamond Wrap by Floral Garden from the Dollar Store is actually Gold Rhinestones on a mesh backing. Hello! I made a couple of non-traditional colored cards using some pattern papers from stash and die cuts. 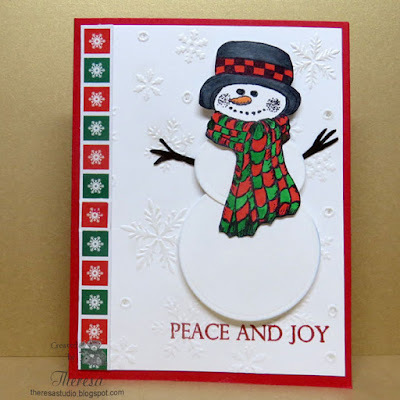 The one above is made with a Sizzix Snowflake die and stamped with an Annabelle Stamps sentiment. The one below uses a Cuttlebug Ornament die. 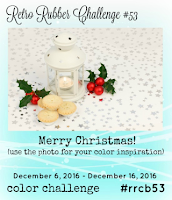 Craftyhazelnut's Christmas Challenge: #311 Color challenge Grey or Silver-a little or a lot. 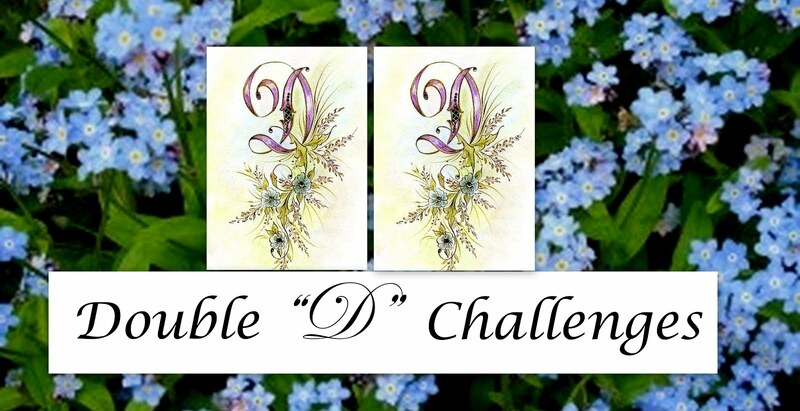 The ABC Challenge: U is for Unconventional. Make a Christmas card with non-traditional colors. Hello! Snow is on the way so I was inspired to build a Snowman with paper. 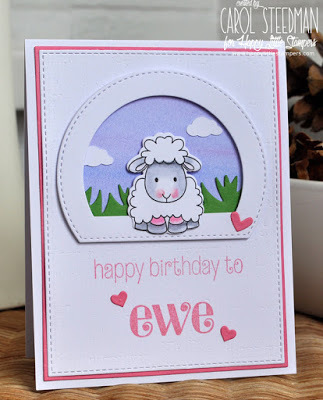 I stamped his head with an old Heartfelt Creations stamp, colored with Copics and fussy cut. I cut rest of his body with Nesties circle and oval dies. His arms were cut freehand from Brown CS scraps. I assembled him on a White CS panel embossed with Darice Snowflakes EF and added some shine with Perfect Pearls and Sakura Stardust glitter pen to the snowflakes. Added a strip of Pattern Paper scrap, stamped the GKD sentiment with Memento Red Ink, and attached to a Red Card Base. Retro Rubber Challenge: Challenge #rrcb53 Merry Christmas Color Challenge. 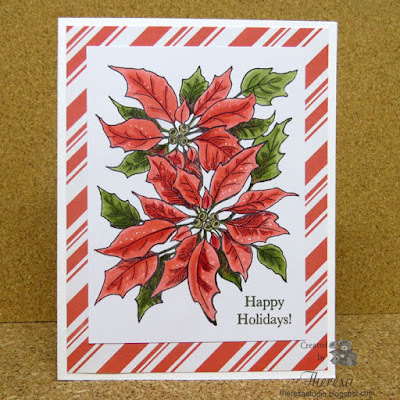 Used red, green, and white with silver glitter which does not show in photo. Have had the Snowman stamp since 2014. 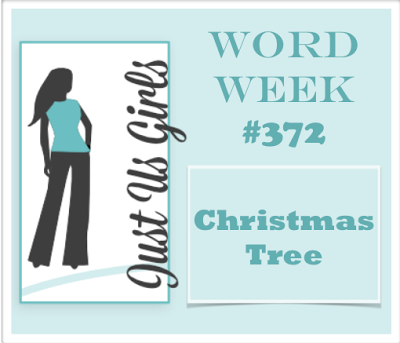 Inspired By All the Little Things: Challenge #35. 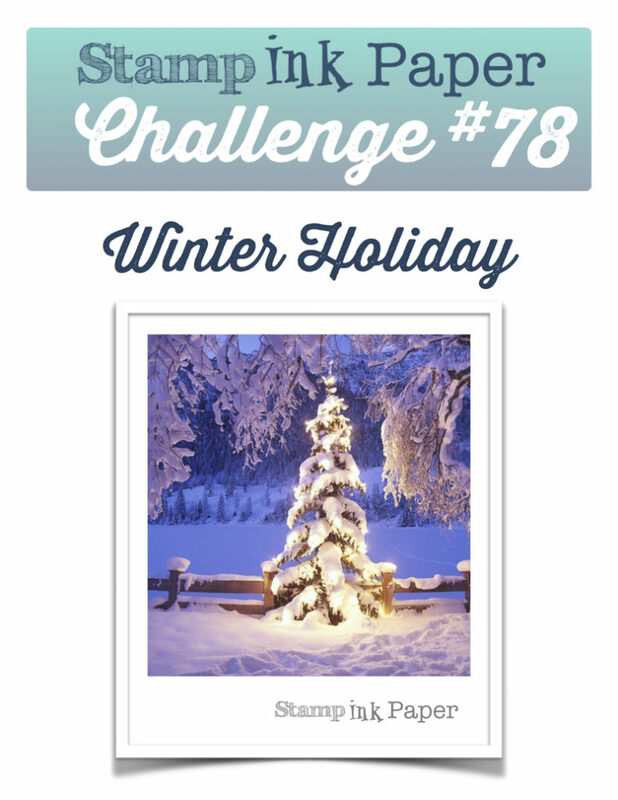 I was inspired to use a snowman on my card by the Photo and Silke's inspiration. The Paper Players: Challenge PP324 Nance's Theme Challenge is Snowflakes. 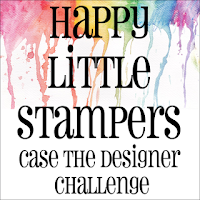 Addicted to Stamps: Challenge #233 Holiday. Hello! I have 2 versions of the same card but used white background on one and red on another one. 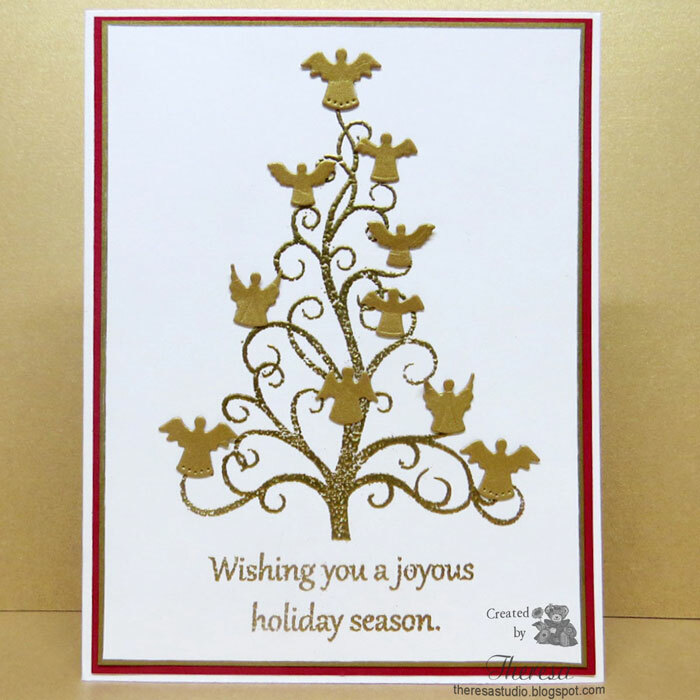 I stamped the tree and sentiment from GKD Joyful Holiday set and heat embossed with Gold EP. 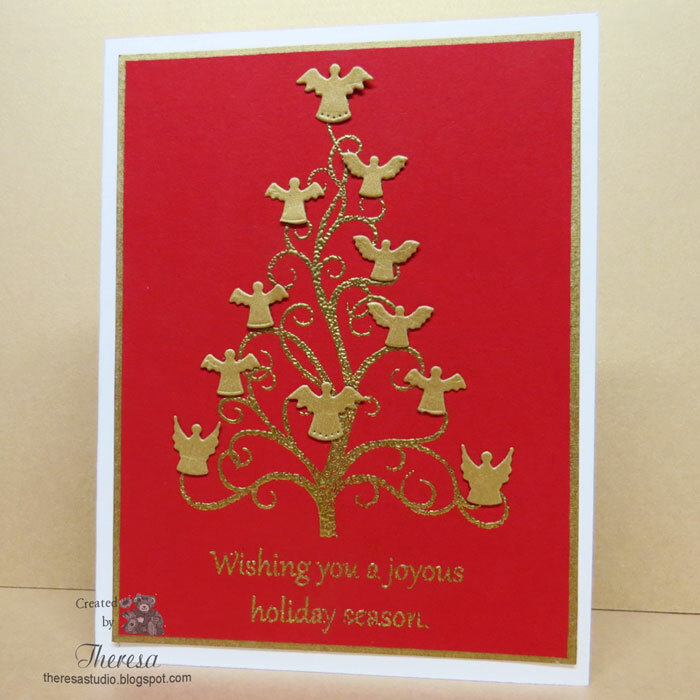 I decorated the tree with Gold Metallic Angels cut with Memory Box A Choir of Angels die from Gold Metallic CS. I used white card base on each and used Pilot Gold Metallic marker to edge both images. 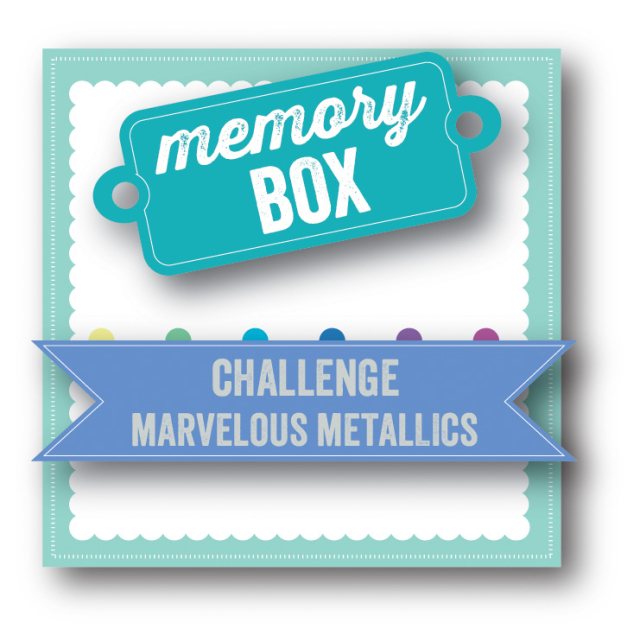 Outside the Box Memory Box Challenge: Challenge #19 Marvelous Metallics. 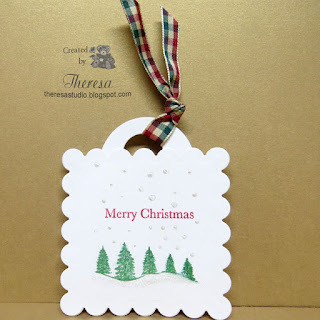 Love the little angels cut with Memory Box Die. As You Like It Challenge: Favorite Gold or Silver (and Why) I have always favored gold over silver. I think gold has a warmness and shine that I love. And gold with red is such a rich combo. 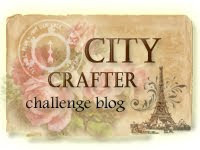 Crazy 4 Challenges: C4C365 - using the word ‘STAR’ – incorporate something starting with each of the letters in the word. 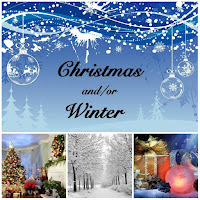 Sentiment for S, Tree for T, Angels for A, Red for R.
Craftyhazelnut's Christmas Challenge: #310 Vintage or Anything Goes for Christmas.